63. Household coverage with piped water has remained consistently high in countries within the Danube watershed since the beginning of the millennium. EU Member States and candidate countries have witnessed a small but significant increase in service coverage, which is mirrored by a small but significant decline by non-EU countries, including Moldova and Ukraine. Figure 22 also shows the persistent and slowly widening gap between EU member and candidate countries and their less-EU-integrated peers in the East. 64. On average and based on household survey statistics, 83 percent of the population in countries within the Danube watershed have access to piped water in their dwelling. However, not all households receive their water supply from public utilities, since average coverage through formal public networks is reported to be only 74 percent. The difference of about 10 percent can cautiously be attributed to alternative water providers, which could range from small communal systems, prevalent in less densely populated rural areas, or makeshift connections established by the household and unknown to the utilities. As Figure 23 shows, the largest gap between public utility and alternative provision is in Bosnia and Herzegovina and Kosovo, at 28 and 29 percent, respectively. 65. Spatial differences in access within countries explain why some countries are lagging behind. 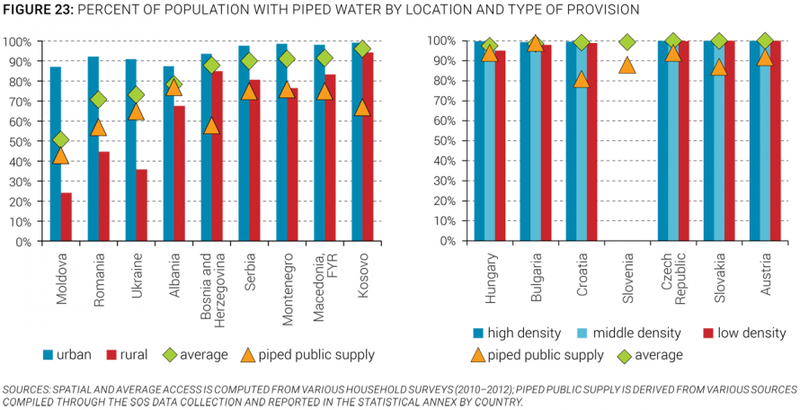 Most EU countries exhibit near-100 percent piped water access irrespective of location (see Figure 23 on the right), and even poorer countries like Bosnia and Herzegovina and Kosovo show a low access gap between rural and urban residents, though with perhaps higher reliance on providers other than public utilities. 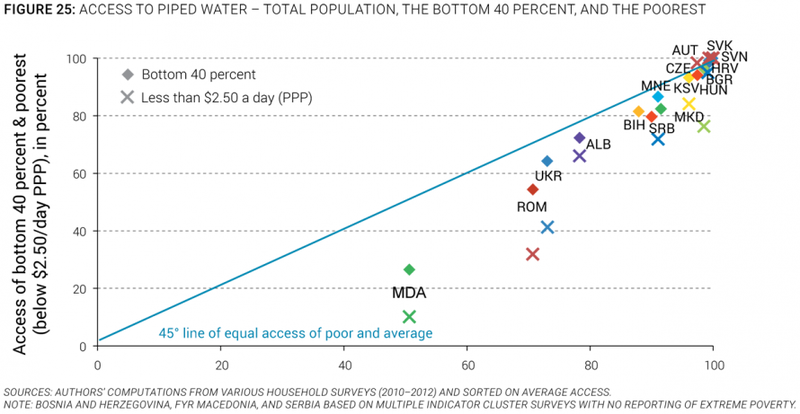 Yet, access to piped water by rural residents is half or less of urban coverage in Moldova, Romania, and Ukraine, which are also the countries with the lowest average access to piped water. 66. About 22.5 million people, or 17 percent of the region’s population, have no piped water supply in their dwelling. Half of the population without piped water is located in Ukraine (12.4 million) and another quarter is located in Romania (5.8 million), mostly in rural areas but also with large populations without piped water in urban spaces. Overall, lack of piped water access is largely a phenomenon of rural or less densely populated settlements, which typically lack the economies of scale to cost-effectively provide network services through modern infrastructure (figure 24). However, it is important to bear in mind that almost all people (99 percent, excluding Kosovo) are reported by the Joint Monitoring Program to have access to improved water sources, including protected wells, springs, and other onsite solutions, to meet their water supply demands (WHO/UNICEF 2012), so the challenge in European countries and their neighbors is more about service standards than basic needs. 67. Access to piped water by poorer segments of the population can be only partly explained by differences in the wealth of a country. Richer or more mature EU countries (Austria, Croatia, the Czech Republic, Hungary, Slovakia, and Slovenia) managed quite successfully to include poorer segments of the population (that is, the bottom 40 percent and those living on less than $2.50 a day PPP per capita), as shown in Figure 25. Yet, some of the poorest countries, notably Kosovo with the second-lowest per capita GDP among the Danube countries (US$8,700 PPP in 2013), also managed to ensure high access for the bottom 40 percent (93 percent) and the poorest (84 percent). In contrast, Romania’s GDP per capita is slightly higher compared to Bulgaria’s (US$18,600 versus US$15,900 PPP), yet, average access to piped water is lower in Romania (71 percent versus 98 percent in Bulgaria), and significantly so for the bottom 40 percent (54 percent versus 96 percent) and those living on less than $2.50 a day PPP (32 percent versus 76 percent). 68. Compared to their non-Roma neighbors, Roma generally have lower access to water and sanitation in most countries of the Danube watershed. Informality or remoteness of Roma settlements, discrimination, outstanding utility bills, and lack of financial resources to pay connection fees interact together but differently in each locality to explain limited access. Results from a survey of the largest Roma settlements in Bulgaria, the Czech Republic, Hungary, Romania, and Slovakia reveal significant differences in access to improved water and sanitation by Roma compared to their non-Roma neighbors (see Figure 26). While these estimates do not reflect country-level statistics, they are important because they compare households living in the same neighborhood (thereby controlling for remoteness) but coming from different ethnic backgrounds.